EVGA currently sells a range of products: motherboards, graphics cards, power supplies, cases, and laptops. EVGA has been expanding to other markets for a number of years now, and at CES 2016 we saw the beginnings of a USB audio device due to a collaboration with a professional company called Audio Note. We were impressed at the time, but since then we've not heard much about the project, and had kind of assumed it had been abandoned. But at CES 2019 EVGA introduced the results of the collaboration: its first audio card. This card uses a PCIe to USB controller, making it an internal USB audio product. 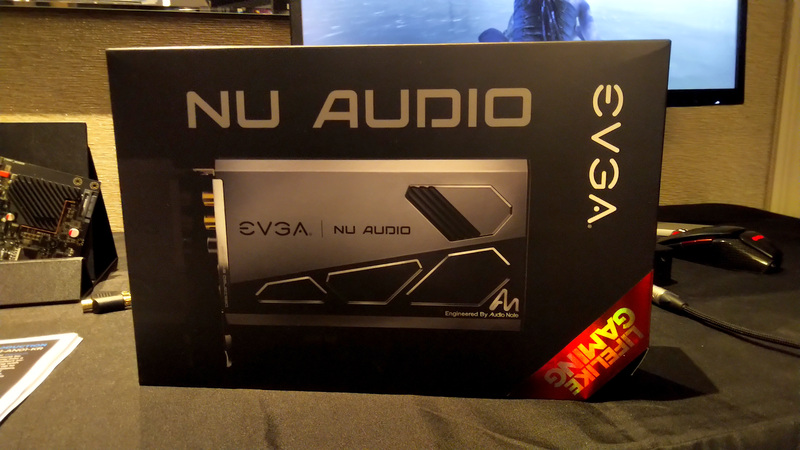 EVGA’s Nu Audio card was designed by Audio Note, a UK-based company that develops custom audio solutions. The PCIe 2.0 x1 card implements a PCIe to USB controller to the hardware, and is based on the XMOS xCORE-200 DSP accompanied by Asahi Kasei Microdevices’ (AKM) AK4493 DAC, the AKM AK5572 ADC, and the Cirrus Logic CS5346 ADC. The board uses a silver and gold-plated multilayer PCB with isolated dual ground planes for analogue and digital circuits. Being aimed at users who want a cleaner sound but also better sound support out of their audio outputs, the Nu Audio card uses audio-grade capacitors and resistors that carry Audio Note, Nichicon, WIMA, and Panasonic brands. Besides, it features switchable OP amps as well as a dedicated Maxim amp for headphone volume control. The Nu Audio card is equipped with two RCA line outs for left and right speakers that can output 384 KHz at 32-bit audio, one output for headphones featuring impedance between 16 and 600 Ohms, an S/PDIF out, a line in supporting 384 KHz at 32-bit audio, and a mic in supporting 192 KHz at 24-bit audio. In addition to traditional analogue and digital outputs, the card supports USB audio class 2.0 enabled by the ASMedia ASM1042 PCIe-to-USB bridge. Meanwhile, to ensure that the board gets enough power, it has a SATA power connector coupled with a multi-stage VRM. Since EVGA usually targets enthusiasts, its audio card is not only outfitted with a cooling system for heating components, but it is covered by a shroud featuring 10-mode RGB lighting as well as four Audio Reactive Lighting options that match the board’s lighting and audio. The bundled software allows for full EQ tuning, as well as a dynamic response implementation. With the right software, the audio card can support full audiophile formats, such as DSD, and switch between them as required. EVGA is now currently selling the card, at a price of $249. This is the first in a line of cards, we were told - depending on the feedback of the hardware, the collaboration with Audio Note might extend into a gaming focused design or a more professional audio input/output design. Do people really still buy audio cards? Hhmm, I'm sure they have some experience as audiophiles, but that doesn't stop them from taking the "bigger numbers are better game" too far. Let's take their dynamic range for example. 24-bits are enough to encode 140dB of dynamic range, and arguably even 16-bits with dithering reaches 120dB of dynamic range. And then their hardware only supports 123dB of dynamic range! That 32bit audio support is just pretty misleading marketing then, if your hardware can't output a full 24bit by a wide margin. But at least 32bit audio is not *worse* than 24 or 16. It's just not better. The really dishonest trend is those 192kHz and 384kHz sample rates. The short of it is that 44.1kHz and 48kHz are legitimately enough to perfectly (per the awesome Sampling theorem!) encode all sounds your hears can perceive, anything higher is ultrasonics that you can't hear, but that can and does add noise over the whole spectrum. That audio is there and has to be processed when you chose a high sample rate, the problem is that audio hardware can't low-noise over the whole spectrum, not at any reasonable price. Depending on how much your audio hardware prioritizes quality in those ultrasonic frequencies you can't hear (and that's unheard of, pun intended!) the noise might go from imperceptible to shockingly awful. All in all the card might be good, the THD+N value looks totally acceptable for a PCIe card. But the truth is it won't be better quality than a cheap USB DAC. If they know what they're doing like you say, then this card's trying to take advantage of audiophiles who don't understand all those numbers, and I can't recommend supporting this. I won't say there's no justification whatsoever for higher sample rates. Some margin is useful in analog filters (but again within reason, or any non-linearity near high-frequencies in your filters will further degrade the lower part of the spectrum). But at the end of the day I can't take those numbers at face value and tell people that this is a superior product. And how good are those oversampling filters? I'll grant you than 384 kHz is overkill, but if the source material (e.g. mastering software, digital synths, etc.) can produce real signal at that rate, then oversampling can only be worse (i.e. by introducing artifacts). So, you're arguing against oversampling DACs? I think that argument was lost over 30 years ago. While not as common as 44.1 or 48 kHz, 96 and 192 kHz content has been with us since the mid 1990's. Since then, most recordings have probably been mastered in 24-bit/96 kHz or above, providing a massive catalog of potential content. These days, you don't need a new distribution format, like DVD Audio - you can simply add the format to new or existing streaming services. If you'd read the other comments you'll see that I'm not arguing against oversampling DACs. I'm arguing against oversampled content. Also throwing labels around isn't something I'm interested in, but since you've opened that up: no one should be proud to be an audiophile. Audiophile is a label that's been hijacked by a delusional group who throw objective measurements out the window because they don't want to put the effort in to understand what's going on. They're happy to be fooled and be taken for a ride. You're right. I am no audiophile.